Loan agreements are only available to UK residents over 18, subject to status, terms and conditions apply. 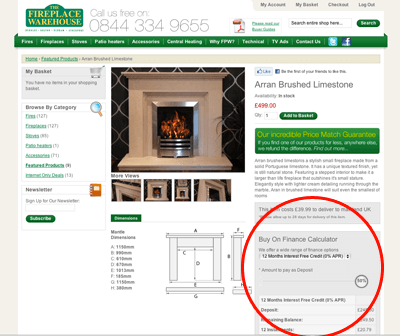 At The Fireplace Warehouse we can now offer 0% finance on all our range, over £300, so you can get the perfect fireplace for your home, and spread the payments over a time period of your choice. 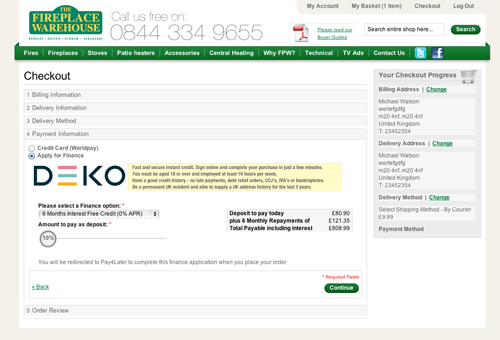 You can apply online safely and securely with DEKO and pay nothing for 30 days. No signature, paperwork or postage required! As long as you are over 18, a UK resident and have 10% deposit available, you can pick from our fantastic range today. How does the finance application work? You can use the slider to pick your deposit amount, and easily see your monthly payments, with various options in the drop down menu. Select DEKO, and when you confirm your order you will be taken to the secure DEKO servers to make your quick and easy finance request. It really couldn't be simpler. If you have any questions please don't hesitate to call 0844 344 9655. Consumer credit service provided by DEKO in association with Close Brothers Retail Finance. DEKO is licensed by The Office of Fair Trading (Consumer Credit Licence: 0616240). For more information please refer to our frequently asked questions or visit dekopay.com. How do I ask a question about the Credit Agreement? If you have a question, require further information or if there is anything you do not understand regarding the credit agreement, please call Close Brothers Retail Finance on 0844 880 6542 or seek free, independent advice from organisations such as the Citizen Advice Bureau or the Money Advice Service. How long does it take to apply online? Our online application form typically takes a few minutes to complete. Your application is then instantly sent to the finance company and they will typically respond with their decision in around 10 seconds. Some applications may take longer to process. If for any reason we can't give you an instant decision you will be notified on screen as part of the application process and also by e-mail, with a follow up e-mail as soon as a decision is confirmed. What are the requirements for finance? You must be a permanent UK resident and able to supply 3 years address history. Employment or retired and receive a gross annual income of at least £10,000.Have a good credit history and own a debit or credit card. You must have a UK bank account capable of accepting Direct Debits. The goods must be delivered to your home address and the deposit must be paid using a credit or debit card. Can I cancel my credit agreement if I change my mind? You have the right under section 66A of the Consumer Credit Act 1974 to withdraw from the agreement without giving any reason before the end of 14 days (beginning with the day after the day on which the agreement is made or, if later, the date on which we will tell you that we have signed the agreement). If you wish to withdraw you must give the finance company notice in writing or by telephone or email. The name of your finance company will be clearly shown on your credit agreement (see contact details below). Please note that if you do give notice of withdrawal, you must repay the full amount of the credit without delay and in any event by no later than 30 days after giving notice of withdrawal. If you want to settle the loan after the 14 day cooling off period, you may do so but you will also have to pay interest accrued from the date the agreement was made until the date you repay it. If you wish to pay by debit card please telephone the finance company. If you wish to pay by cheque please send it by first class post to the finance company. Please allow 10 working days from the day you post the cheque to allow time to process the payment. Will the finance company perform a credit check? Yes. A credit check forms part of the automated decision making process. Do I need a bank account? Yes. You must have a UK bank account capable of accepting Direct Debits. Do I need to pay a deposit? Yes. If your credit application is accepted, you will be required to pay a deposit online, using a credit or debit card. The amount of the deposit is shown in the credit summary (displayed on the top left hand side of the screen throughout the credit application form) and on the credit agreement itself. How do I repay the loan? Your monthly repayments are collected by Direct Debit. How much does the loan cost? The total cost of the loan is shown on the finance agreement. Are there any other charges? If you fail to pay any amount you owe under the Credit Agreement by the date it is due, Close Brothers Retail Finance may charge you interest on that amount, they may also levy additional fees – details of these can be found in the credit agreement. How long before I have to start to repay the loan? Close Brothers Retail Finance will write to you to confirm the date that your repayments will commence. The first payment is typically due 30 days following the date of delivery of your order. What APR will I be charged? The APR is shown clearly on the credit summary (in the top right hand corner of the screen) throughout the credit application process. It is also shown clearly on the credit agreement itself.